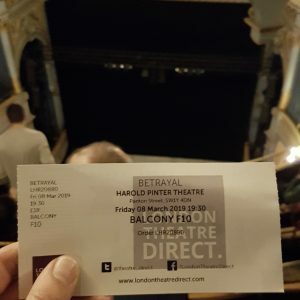 I was lucky enough to snag a handful of pre-sale tickets for Betrayal as part of the Pinter At The Pinter series. 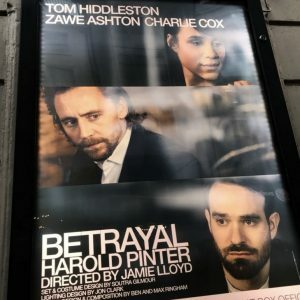 The play stars Tom Hiddleston, Zawe Ashton and Charlie Cox, and is directed by Jamie Lloyd. The show runs 90 minutes without an interval at the Harold Pinter Theatre. The story of Betrayal follows Robert, his wife Emma, and his best friend Jerry over the course of seven years, in reverse chronological order, uncovering a web of lies and betrayals. What struck me first was the stage design, a very simple silver-grey floor with an unassuming back wall. There is a large circle in the middle of the stage floor, which revolves at different speeds and in different directions to depict the passing of time, reversal of time between scenes, and the slowly drifting apart of the characters themselves. It is beautifully done and very impactful in its pure simplicity. Other than that there are few props used, a few drinks bottles, a table, a few chairs, everything is kept at a bare minimum, which lifts the plot up as the central point without any distractions. All three actors excell at potraying subtle emotional shifts, drifting effortlessly through a variety of scenes. There was a surprising amount of well played humour in this play about broken relationships and betrayal of loved ones. The lighting effects and staunch shadows on the moving back wall were remarkably intense, having me and several of my friends stare at the crisp profile shadows rather than the actors themselves, making the conversations between even the more haunting and intense. A superbly acted and staged play, I can’t recommend it enough. If you have the chance at all, go get tickets to see Betrayal while it’s still running. Full six out of six rainbow sloths from me.